While it would be easy (and very cliche) to dedicate the November Tech Tips to giving thanks, I thought I would take a different tack. Despite the record temperatures in the Philadelphia area over the past weekend, we know that for sure it will start getting cooler as winter approaches. So why not look at some cool things that are new in the Microsoft tool kit? Week 1 of our Tips for November leads us off with Planner; a new solution in the Office 365 suite that is a task list, but a WHOLE lot more! Man With A Plan, or a Planner! No, not the new sitcom for another “Friends” alum, the man (or woman) with a plan may be using Microsoft Office 365 Planner. Planner is part of the Office 365 suite. It is not available as a standalone. There don’t seem to be any plans to do so. For those of you who work in teams and struggle to keep tasks on point, this may be the solution for you. Click the link in the image to learn more about Planner! As Thanksgiving is sneaking up on us, we wanted to share our staff’s takes on the traditional (and less-than-traditional) turkey this time of year. 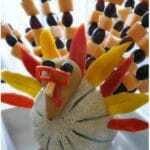 If you’re not a fan of turkey, or maybe a vegetarian, maybe Sabine Mueller’s Fruited Turkey creation would fit the bill! Check back next week for some more turkey surprises!